Since its inception in 1944, the National Trust has been deeply involved in the identification, recognition and conservation of the built and landscape heritage of Parramatta. In 1951, the Trust successfully opposed the construction of a speedway around the perimeter of Parramatta Park. The Trust’s first Register of 39 historic buildings and sites in NSW, produced in July, 1946, included seven Parramatta properties. On 30 April, 1970 Her Majesty Queen Elizabeth honoured the National Trust by opening Old Government House in Parramatta Park, restored by the Trust and which is the oldest public building in mainland Australia. 67 properties in North Parramatta have been listed on the National Trust Register, the most recent being the Former Female Factory (1818-1849) in March 2014, although this property was earlier listed as the Parramatta Psychiatric Centre Precinct in 1975. In 2000, the National Trust’s Parramatta Branch produced its Parramatta CBD Housing Survey and, in 2010, Parramatta Park’s Old Government House and Domain (1788 – 1856) was inscribed on the UNESCO World Heritage List as part of the Australian Convict Sites World Heritage Property. On 28 August 2014, the NSW Government declared a $2 billion redevelopment of the heritage precinct of North Parramatta, with the area named as a state significant site. The development involves 3,900 new apartments in high-rise buildings up to 30-storeys high in a 146 hectare area directly adjoining an inscribed UNESCO World Heritage Area. 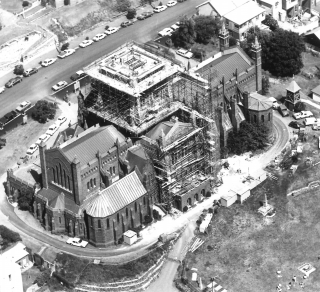 It could also impact adversely on heritage listed buildings and the landscape of the 1848 Cumberland Hospital, the 1818 Female Factory, the 1866 Wisteria Gardens, the 1835 Parramatta Gaol and the 1841 former Roman Catholic Orphan School. The Trust seeks specific commitments from the State Government and Parramatta City Council that no development will be proposed within or adjoining the World Heritage Area (Parramatta Park, including the Parramatta Stadium Precinct) which would adversely impact on the World Heritage values of this Area. The Trust understands that there is considerable high-rise commercial/residential tower development proposed within the Parramatta CBD, which reinforces the importance of conserving the 166 year old Cumberland Hospital / Wistaria Gardens landscape intact for future generations to experience and enjoy. The National Trust opposes the removal of the historic rail line from Newcastle to Wickham.